Wednesday, March 18, 2009 Posted by Stephanie H.
It is critical to maintain and upkeep your outdoor fire pit to increase its efficiency and longevity. The maintenance of your fire pit is virtually pain free. The only requirements are a little bit of time and work. It is imperative to remember to NEVER pour water on your fire to extinguish it. 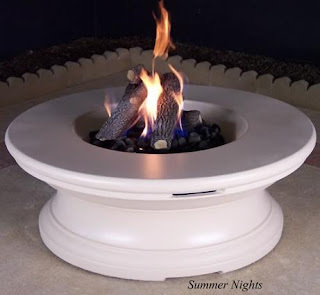 The drastic change in temperature is not good for the fire pit and can result in breakage or deterioration of it. It is also very important to remember that you need to keep your fire pit covered once it has cooled and is no longer being used. A cover will protect the pit from all forces of nature and prevent any rusting or damage from being done. If you live in an area where there are harsh winter conditions, it is recommended that you store your fire pit in a dry, sheltered area. This will keep your fire pit in prime condition, prevent it from any cracking or weathering, and allow it to be of use for countless years to come. When cleaning out your fire pit, first make sure that the ashes have cooled enough to handle. Generally, this should be done the day after your fire has gone out. When removed, make sure to seal the ashes in a closed non-combustible container. You don’t ever want to start a new fire among old ashes because it will just make a bigger, harder to clean mess for you the next time you plan to clean it out. To prevent any big messes and tough clean up jobs – refrain from placing any plastic or other material objects that will melt into the fire. This will help keep your fire pit looking new and lasting longer! There is nothing more relaxing than enjoying a fire on a cool evening outside. Your fire pit is a luxury item that is meant to be enjoyed with family and friends. These easy maintenance tips will keep your fire pit in excellent condition and allow you to keep using your fire pit for several years to come.